We are in an era where the availability of natural resources is not sufficient to support the wealth levels that the developed world has grown accustomed to, along with the speed of growth with which the developing world is trying to approach those same levels. So, this is represented by oil prices rising (along with food and other commodity prices more generally). But the effect of this is not to place a uniform drag on growth, because the global mind has not accepted this truth yet. Instead, the global economy keeps trying to grow in a way that is inconsistent with the resource constraints, and then some part of the system tears and gives way. So, in 2007/2008 the sector that gave way was the American subprime consumer, along with a significant chunk of the financial system that was predicated on the idea that poor Americans could continue to take on more and more debt indefinitely. Instead, rising gas and food prices eventually destabilized the finances of that sector of consumers, they started to default, then their lenders started to default, financial contagion set in, and the situation was only stabilized with massive extraordinary interventions by sovereign governments. That worked, but left a lot of the sovereigns in significantly weaker condition than before. Now poor Americans borrowing more and more to bid house prices higher and higher was always an unsustainable trend that was going to end in tears one way or another. But the timing was likely determined by the oil/food price shock that ended in 2008. So now, just three years later, here we are again with oil and food prices rising fast, and the question in my mind is this: what part of the global fabric tears next? And when? "rising gas and food prices eventually destabilized the finances of that sector of consumers, they started to default, then their lenders started to default"
I've seen this said often on TOD, but I've seen no proof of it. As best I can tell, the housing bubble simply reached an unsustainable level and popped pretty much of it's own accord - at a certain point 1) it was not possible to find a "greater fool" to buy empty spec houses and 2) ARM resets revealed that home buyers could not afford their loans, regardless of minor changes in their gas and food expenses. That inspired me to look for a more systematic way to illustrate the relationship between energy prices and US recessions. I'm focussing on the US because it has a large economy and the records go back for a long time. (Well, it probably has to do with me living here too). I used the standard NBER recession dates. For energy prices, after some poking around, I settled on using data from FRED for the "Producer Price Index for Fuels and Related Products and Power (PPIENG)". You might wonder why I didn't use something more obvious like oil prices, and the reason is that I couldn't find a monthly oil price series that goes back before the 1970s. 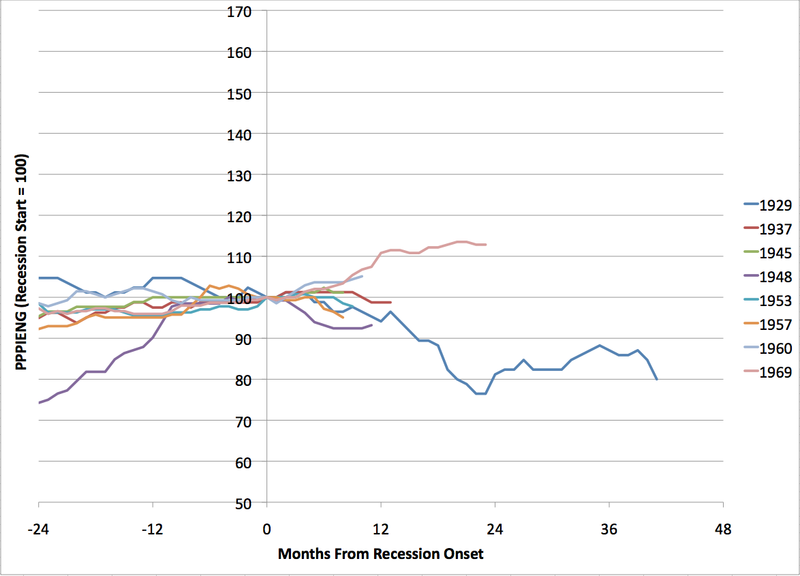 The PPIENG series goes back to 1926, and is monthly, allowing us some decent time resolution while looking at a larger sample of recessions. Then for each recession, I took the PPIENG from 24 months prior to the onset of the recession up to the end of the recession (they vary considerably in length). I rescaled it to be 100 at the onset of recession. (The recessions are labelled by the year in which they began). Clearly, you'd have to say that rises in energy prices were not a major factor in the lead-up to recessions in that era (with the possible exception of the 1948 recession). 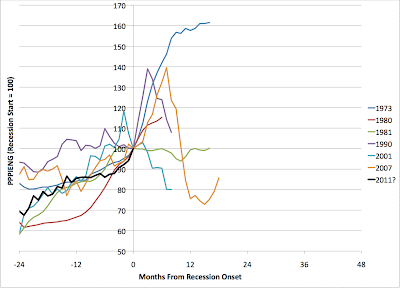 In every case, energy prices were rising either before or immediately at the onset of the recession, and in every case they "broke" in some sense before the recession was over - either declining, or at least sharply slowing in growth. The paradigm case is 1973 where energy prices were rising steadily and then a huge oil shock coincides with the start of the recession, which only ends after prices have stabilized. However, even in cases like 2001 where most of us would think that energy prices had relatively little to do with the recession, there is a pattern that they were growing rapidly before the recession, and then broke near the start of it. The least clear case here is 1980, where the lead-in to the 1981 recession overlaps with the 1980 event, and you could argue they are really one phenomenon. So I would argue that this data is at least consistent with the narrative that, in the post 1973 era, energy is consistently in somewhat problematic supply, and you can think of many of the recessions as showing a pattern in which energy prices are rising as the world overshoots what can currently be supplied, or what can currently be supplied drops as a result of geopolitical events, and energy prices rise until some pre-existing weakness in the global economic fabric tears in the course of a recession, and prices fall back again. In some cases, perhaps, like 2001, the thing was about to tear on its own anyway, and energy prices fall almost immediately at the onset the recession. In other cases, like 1990 or 2007, it perhaps wasn't quite ready to tear, and energy prices had to rise substantially more before finally breaking. Obviously, this is necessarily rather anecdotal, since we only have six data points. If we look at trough to peak change in energy prices in these intervals, the factors are as follows: 1973: 2.0, 1980: 1.9, 1981: 1.7, 1990: 1.6, 2001: 1.9, 2007: 1.6. This is a crude indicator, since in some cases the trough was clearly before the start of my 24 month lead-in, and I didn't go back before that interval. I also didn't make any attempt to correct for general monetary inflation, which is not a constant across these episodes. Still, it's probably a robust pattern that a change in PPIENG of around 50-100% is associated with the onset of post 1970 recessions. At the present time, there's a 48% increase from trough to present in PPIENG. So that's just off the lower end of the historical range, but getting there. 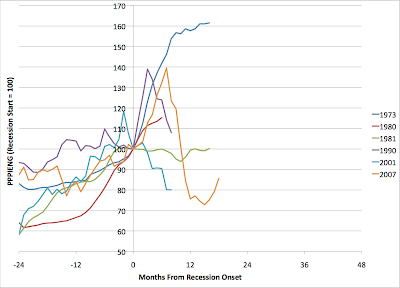 I stress that I'm not saying that a recession started as early as March 2011 - I doubt that. Thanks once again Stuart for your excellent data research. After this musing of mine, however, I did notice the graph at your FRED2/PPIENG link, http://research.stlouisfed.org/fred2/graph/?id=PPIENG shows that PPIENG was less volatile prior to 1973, though. Perhaps that's the explanation. While at that site, I redrew the FRED graph to display only the 1926 to 1975 time period to better see the older data and, while the older PPIENG data is not the flat line the later 1926 to 2011 graph suggested, PPIENG was fairly constant prior to 1973. This roughly suggests to me that the US economy really did enter a new paradigm after US oil production peaked. Yes, I think the key issue is that the economy didn't encounter significant energy supply constraints from 1926-1972. Since then, it periodically has. Regarding the 1980 / 81 recessions, the 1980 event was surely brought on by the 79 oil shock following the Iranian revolution. However we were also in the midst of very high inflation, and by 1981 Volker had taken the bull by the horns and was producing a Fed-induced recession designed to bring inflation in check. By that point it certainly was not a "market" phenomenon any more. Fascinating stuff, Stuart. I've dabbled with tracking the aftermath of price spikes a bit too, and notice that we are currently at the same stage in re: 2008 as we were in 1983 in re: 1981, i.e., at 34 months after the peak in price we're at 76% of that peak value. Of course in the 80s the price slowly came down, whereas now it's headed in the other direction. Maybe compare the intervals between troughs/peaks? This is getting a bit Elliot Wave. We had an ascending price in 2004 but no recession, you notice. The historic gasoline price series (annual) at the EIA makes it look as if the whole 20th century was one long secular trend down in real units, with 1973-1986 just a departure. So we're consistently vulnerable to energy prices as never before now? PPIENG has a distinctly different shape, I notice. This is a classic correlation vs causation issue. One could offer a counter-vailing interpretation where energy prices are a function of economic conditions, where boom conditions bid prices up and recessions lower them again, with causation going in the other direction. A (not terribly realistic) way to resolve this would be to do deeper economic modeling on what actually caused each recession. The 81 recession was clearly caused by Fed policy to wring inflation out of the system with high interest rates. Were you using WTI or Brent for your price? Since Brent has been running $10-15/bbl higher than WTI due to the glut at Cushing it would seem to make a difference for this year. Wyoming: Neither, I'm using the Producer Price Index for energy goods. Brent: Agreed attribution is always tricky, and at this point I'm not claiming more than that this evidence is consistent with my story. For your countervailing interpretation, what would be the story for why it didn't work that way before 1973? Also, as to "The 81 recession was clearly caused by Fed policy to wring inflation out of the system with high interest rates." I think it seems to be pretty common for recessions to be multiply caused. For example, my view would be that the 2007 recession was caused by both the oil price shock due to the oil supply stagnation, and the housing bubble bursting. Either would have been sufficient by themselves, though either acting along would have taken longer to occur. I have to say, I struggle with communicating about this issue a little. It's always seemed blindingly obvious to me that, thermodynamically, the economy is a dissipative system that runs on finding sources of low entropy and degrading them to high entropy, and that if anything happens to reduce the input supply of low entropy, the system has no choice but to slow down, in the short term. It's for exactly the same reason that if you turn the heat down under a pan of boiling water, the intensity of boiling will immediately slacken. (This is only a short term truth - in the long term, you can put a lid on the pan and it will boil intensely again even at lower heat, and similarly, you can improve the energy efficiency of the economy and then it will be able to be more productive with less energy input). It seems to me that all available data are pretty much consistent with the obvious intuition. However, for economists, who don't have a physical science background, this doesn't seem to be an obvious or natural intuition at all, and it's not so easy to persuade someone that starts with a different viewpoint, based on a handful of rather ragged episodes. Stuart: How do you know that energy is the culprit? You have to compare it to things like total credit (M2 series goes back a ways) or initial claims from BLS, also goes back a ways. 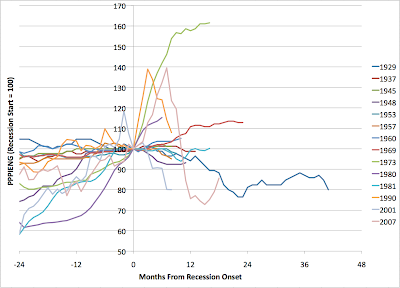 Both will show that they correlate more closely with recession (without the apparent lag from oil). All your chart proves is that energy prices rise when the economy peaks (right before it starts a contraction), or with maybe a year delay from official recessions. It does not prove that the oil prices caused the recession in any way. This blog post uses a graph from Hamilton of energy as % of total consumer expenditures: The Bonddad Blog: Oil Prices and the Recovery. The shape looks much more like the EIA's chart of historic gasoline prices than PPIENG; wonder if Hamilton has considered PPIENG and found it wanting somehow, etc. BEA has all sorts of series for fuel etc, too, all monthly and going back decades. Maybe a gallery would be instructive. Stuart, you do a fine job on agreat site. Re: "It's always seemed blindingly obvious to me that, thermodynamically, the economy is a dissipative system that runs on finding sources of low entropy and degrading them to high entropy, and that if anything happens to reduce the input supply of low entropy, the system has no choice but to slow down, in the short term," yes. I go even further, proposing that as energy costs increase we'll encounter negative synergies. That is, in the 50s and 60s we obtained the synergistic economic effects of using cheap, abundant energy without regard for depletion or environmental cost. In future those synergies will be reversed, and the effect must be contractionary. Yes, we can mitigate, but even mitigation will be offset by higher energy costs. It seems strange that few can see the vertically-integrated and distributed effect of cheap energy. We have lived in a time of historically-unprecedented abundance that's drawing to a close. The strength of resistance to the idea - essentially, that we've been living in an energy "bubble" and will revert to a historical mean - tells us something about collective human perception and thought that's not too encouraging. SDRs are practically identical in nature to US Dollars and were made to be such by the IMF. That alone, when Krugman knows better, shows that he's quite intellectually dishonest, IMO. I still have some respect for his theories on cross-border capital flows, but his recent much too pro-Keynesian view points are grating and his intellect is better than the dishonest arguments he is making. Just as an example; he could have used the US Dollar Index, which IS a basket weighting of major currencies. That would have shown the US Dollar at lows only exceeded by March 2008. Burk Braun was correct in pointing out correlation vs causation. I would like to look at the differences before and after 1973. What is the big change in the US at that point? Nixon took us off the gold standard, which allowed big changes in the ppg (inflation). prior to that period, gold/oil did not vary that much. I suggest looking at monetary base debt and inflation as causes of both recessions and higher oil prices. There were no large energy price increases prior to 1970. In its annual review BP publishes data on annual oil prices back to 1861. From the end of WW I to 1970 the nominal price of oil fell almost continuously. You could begin to tease out the cause and effect relationships by doing the same analysis for other commodities that are associated with the classic booom-and-bust of commodities in the business cycle. A good one might be copper. I think you'll find a very similar set of charts, which suggests that the case for oil causing recessions isn't quite a strong as one might think. 2nd, a good intermediate variable might be inflation and interest rates. Will oil prices cause a recession? Only if central banks react to rising commodity prices by acting to choke off the money supply. Right now, for instance, both the ECB and Chinese authorities are raising rates in reaction to commodity inflation, but the Fed is taking the approach that food and energy increases are "non-core" temporary phenomena. 3rd, before 1971 there was easy slack in oil production: the Texas Railroad Commission could always raise the "allowable", and Texas could act as the swing producer and provide whatever was needed during periods of peak demand. After 1971 swing production was in the hands of OPEC, whose production was much less sensitive to US demand. Only after 2004 was there a true ceiling in oil production, causing Peak Oil Lite where production increases lagged demand increases. 4th, there is a big difference between "energy" and oil. The US has a surplus of sources of electricity, and is facing a bottleneck in oil production. Other sources of energy can substitute for oil, but there is a capital expenditure lag, which is a classic economic problem. 5th, there is so much low-value consumption of oil that the US has a very large buffer for oil shocks - think single passenger SUVs - US personal transportation is about 1% utilized. Heck, the US could reduce it's oil consumption by 25% in a matter of weeks with mandatory carpooling, and still get everyone to work on time. Nick G brings up very good points. Copper is certainly another thing to look at. Financial people have been pouring over this data for years and with powerful minds and machines ( I knew a guy from U of Michigan's quant shop, named himself after an ancient Egyptian King if that gives you the idea of how certain they are ;-) And they haven't found squat. Really. I think the word of the quarter is Transitory. But both are quite correct; price increases ARE happening in the 'temporal' realm AND you do 'transit' from low to higher prices by going through intermediate prices. Were there any period on the order of the time period you're looking at here, where oil doubled or more, and there was *NOT* a recession which occurred in or immediately after that time period? If there were several such examples, I'm not sure we even necessarily have correlation as much as possibly just luck.... but if we *do* I'm far more inclined to also accept that there is some causative link between the two (which way it runs, or whether both are driven by a third factor, doesn't matter so much to me). Nick G's suggestion about other commodities is not useful, because individually they each make up a much smaller percentage of GDP and of household budgets than does oil. The last synchronised commodity super-cycle was in the 1970s, when oil also rose sharply. I don't think Nick G's second point is right either. The things that can cause recessions are decreases in consumption, investment, government spending, or net exports. Monetary tightening primarily affects investment. But investment can decline for other reasons, and recessions can be consumption- or trade-induced, or they can be induced by an uncompensated decrease in the velocity of money. One, imports increase by 2% of GDP, so GDP declines 2% from trend, since GDP = Consumption + Investment + Government spending + Exports - Imports (and everything else is fixed by assumption). Two, the revenues of domestic oil producers increase from 2% of GDP to 4%. What happens to this unanticipated money? It sits in the bank--in the short run, no-one has time to change their investment plans. In effect, the money is just sucked out of the economy for a while. 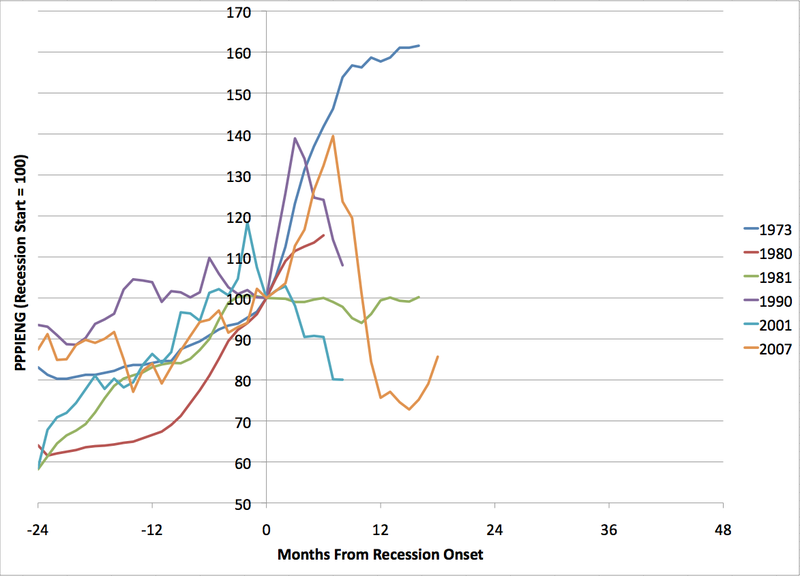 This is a velocity-of-money recession. So monetary tightening is not necessary for a recession to occur after an oil price shock. Nick's fifth point is interesting. An oil price shock could disproportionately affect the US, spurring its firms to adapt their production techniques. While doing so, they would take advantage of other productivity improvements that have arisen since the last time they reorganised. This could be part of the reason for the sustained productivity rise seen in the US, but not elsewhere, during the last few recessions. >The last synchronised commodity super-cycle was in the 1970s, when oil also rose sharply. Arent we seeing that in the grains/oil/PM space from about 2005? The point is all of these top at different times along the boom. And therefore it's hard to merely point to oil or energy within that and say that MUST have been the culprit. So oil topped in July 2008, credit topped in 2007, stocks topped in Oct 2007. Right now; we can see agri related (sugar, cotton in the extreme) topping in Feb/March, Silver topped out in April, and it seems that oil might be rolling over (except for geopolitical risks). So things roll around the markets, and sometimes they mean absolutely nothing, and they cause absolutely nothing. Nick G brings up very good points and I agree with his skeptical attitude towards this. Look at the graph in this article, see what I mean about everything changing in 1971, when the world went off gold. It's all about money and currency, and the fact that they are not the same thing. I would be curious to see a control analysis on random time periods after 1973. What do the mid 80's and 90's look like? It may be that the index is basically continuously increased, with the caveat that some recessions cause a temporary drop, due do depressed demand. What you are describing sounds a lot like a supply shock, which is something economists have been talking about at least since the stagflation of the '70s. The economists you mention sound pretty reasonable. As far as I am aware, the data does not suggest that gas prices have been a major player in economic downturns since the 1980s. Maybe they've made things a little worse here and there, but it's not the cozy relationship you're suggesting. After the stagflation in '73, and the Federal Reserve-induced recession in 1980-81, the obvious explanation for the way energy prices "break" during recessions is that people cut back on purchases, because there's a recession going on. So the price drops. If there's some kind of bubble before the recession, that would tend to make people feel richer, spurring them to buy more and push up prices. You said, "I'm not claiming more than that this evidence is consistent with my story." But clearly the evidence is not consistent with your theory. There are large portions of the FRED graph where energy prices are increasing, yet there is no recession. If the economy really was as sensitive to gas prices as you suggest, this could not be the case. The most plausible, straightforward interpretation of the lack of correlation* between rising energy prices and recessions is that rising energy prices have little or nothing to do with most recessions.